Today I’m thrilled to have Kyle Taylor on the show. Now Kyle is easily one of the most successful bloggers I know. He runs the popular website ThePennyHoarder.com which gets an insane amount of traffic. I’m just going to make a rough estimate here but I’m guessing somewhere in the 2-3 million uniques per month range. He’s got 730,000 email subscribers and almost 2 million facebook fans for his page. The Penny Hoarder was on track to make 10 million dollars in 2015 and Kyle’s results have been nothing short of incredible. Enjoy the show! What gave Kyle the idea to create The Penny Hoarder. How a blog can generate 10 million dollars of revenue in a year. Steve: Welcome to the My Wife Quit Her Job Podcast. Today I’m thrilled to have Kyle Taylor on the show. 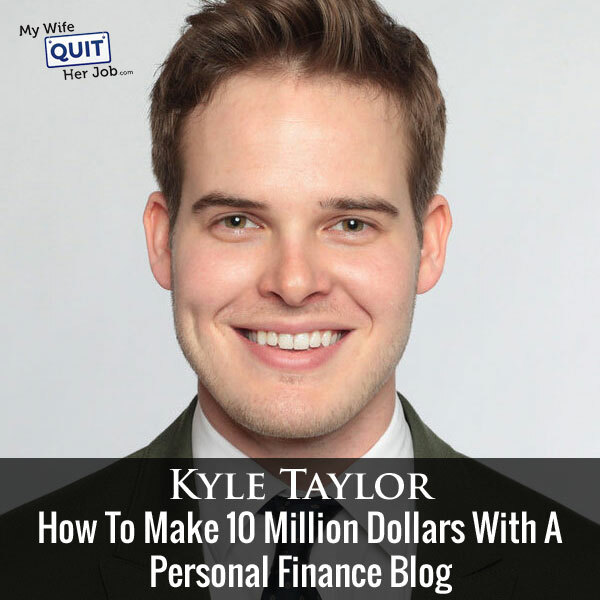 Now Kyle is easily one of the most successful bloggers that I know, and he runs the popular website thepennyhoarder.com, which gets an insane amount of traffic. I’m just going to make a rough estimate here, but I’m guessing somewhere in the three to four million uniques per month range. He’s got 900,000 email subscribers sand over 1.7 million Facebook fans for his page. Here is what’s hilarious, one day he decides to share one of my post on his Facebook fan page, and I got so much traffic from that one Facebook fan page post that it crushed my site. Compared to my own Facebook page which generates maybe a couple of a hundred visits at most for a post, Kyle’s Facebook page was sending hundreds if not thousands of visits per minute, but of course I’ll never know since my site went down. Anyway The Penny Hoarder was on track to make $8 million in 2015, and I think up until July he was just telling me that he only had one employee. His results have been nothing short of incredible, and with that welcome to the show Kyle, how are you doing today man? Kyle: I’m doing really well, thanks for having me Steve. Steve: Yes, so give us a background like we are in like the same mastermind group, but we never really talked about how we all got started and that sort of thing. So what’s your background and what gave you the idea to create The Penny Hoarder blog? Kyle: Yeah, so my passion actually has always been politics, and so for six years I worked on political campaigns and I was traveling all over the country and having a blast. But the thing about campaigns is that you are automatically fired every nine months when the campaign is over. So I was looking for ways to sort of fill the gap and get me to the next campaign, so I started doing all these really ridiculous things to make extra money. And people would ask me how I was doing it, where I was finding these things, and I thought well it would be really fun to document the journey. So I created my first blog, I knew nothing about blogging, it was a BlogSpot domain. And I just started writing about just silly adventures I was having. Steve: Did that turn into The Penny Hoarder or? Kyle: It did yes so it was originally thepennyhoarder.blogspot, and I think like a lot of bloggers I’m sort of instantly fascinating, maybe when I got that first adset check of couple of dollars that you can make money. I sort of wasn’t — I was spending 30 to 40 hours a week in addition to my regular job blogging, but I just knew that if I could just get enough readers this could be a real thing. I moved it to the thepennyhoarder.com, and kept up with it. Steve: Wait so was it your intention to create a huge blog for revenue, or did it kind of happen by accident then? Kyle: It totally happened by accident. Steve: Okay, so when you are on BlogSpot you clearly got a pretty decent following back then or? Steve: No, that’s not bad yeah. Kyle: That’s huge, and I could just see the multiplication effect, and wanted to see how far I could take it. Steve: Then you did not grow up in like a wealthy household either, right? All these topics that you are blogging about kind of struck home; these are things that you actually did, right? Kyle: Yeah that’s absolutely right, I mean I grew up in a middle class family, but saving and budgeting was always a family affair. I was always joked like my mom used to really get us into like we would have competitions every month to see how low you could get the electric bill. We would take — I’m not kidding you, we would take turns everyday going out and reading the meters on the side of the house and we would shut them. We had shut in the house, and we would challenge ourselves, and if we would beat the bill from the month before like we would all go out to dinner or something. It’s always really a family affair and same with making money, but [inaudible 00:05:24]. Kyle: My mum always had these silly things, she was a mystery shopper and so many other things, and we always did as a family, it was always a lot of fun. Steve: So Kyle how does a blog — and this is probably going to blow my mind because whenever I tell my mum how much I make on my blog, she is always like what! How is that possible? I mean your blog is an order of magnitude larger than mine, so how does a blog generate $8 million of revenue a year, so what are you your main revenue sources? Kyle: Yes, so we — this makes it price a lot of other bloggers, but banner ads are a very small portion of our revenue. The industry is really moving towards native advertising, and that’s where we thrive, so we build our content for our partners, and they either pay us on a flat basis or pay us based off on how many leads or sales we send their way. Steve: Can you just define native advertising for some of the listeners who might not know what that is? Kyle: Yeah, it’s a good question because there are a lot of different definitions for it. But the way we consider native advertising is — for us it’s content, and it’s content that is branded with the sponsor in mind. Kyle: Yeah exactly a product placement which can sound kind of nefarious, but because there are a lot of examples of really poor, native advertising on the web. But for us it’s always been really important to one, only recommend things that we would recommend no matter what. Even if we weren’t getting paid we would still write about it. And two is to make the native content almost better than a regular content. We want readers to really feel like they were glad they clicked that headline, and that they actually learned something even though it’s sponsored and even though we are getting paid for it. Steve: Give us an example of one of your most successful native advertising campaigns? Kyle: Yeah, so we’ve done a lot of work with some of the market research companies like Spiebucks [ph] and [inaudible 00:07:42] dollars. Those do really well with our readers because our readers are looking for extra ways to make money. It’s one of our best, we’ve gotten really specific with our targeting, so we’ll do a state level posts like here are the best jobs in Georgia. And in addition to sharing Spiebucks link, we’ll share plenty of other non sponsored content as well. And we hear all the time from readers who get these emails they got a job, or they made some extra money doing this and that. And that to us is the best part; I mean our success is when we get those emails that say I actually got a job from this article. Steve: The advertisers are okay with you advertising their companies in front of potential competitors as well? Kyle: It depends on the advertiser, sometimes there are advertisers that want an exclusivity, but that — in our opinion those actually make for often times less compelling content. I never want it to be a thousand words just a glowing review on a sponsor. We also tell our sponsors when they come on board that we reserve the right to point out the negatives, so we wanted to be a very unbiased review. And our testing shows that those actually convert better, when you point out like the negatives that readers are more likely to take and trust you, and more likely actually try the product or whatever it is you are suggesting. Steve: Yeah, for sure actually so would this be considered native advertising, so on my blog I often do comparisons of different services, and I get down to the nitty-gritty and I point out the flaws and the good things about each, would that be kind of considered native advertising. Kyle: I would, I would actually consider that yeah. Steve: Okay, and so when someone comes up, so first of all do you go out and seek these opportunities or do they kind of come to you? Kyle: That’s changed I think in the last six months. It used to be like we wait for them to come to us, but we’ve began to hire our sales force now, so now it’s a little bit more proactive. Steve: When they come to you is it just because they see a site with lots of traffic they want to get in front of for the most part? Kyle: Yeah, that’s generally it, yeah generally it’s traffic, or sometimes it’s also because they might see a competitor on there, and they’ll email and say, hey I noticed you wrote about such and such how do we get that? Steve: So I mean how did you attract these guys in the very beginning when you didn’t have so much traffic? Kyle: Well I think every blogger can relate to this that no matter what your size is, you are always getting these emails from PR companies or from people who want to link. And even though I wasn’t willing to accept their premise and just write about them, I use this as opportunities to build relationships. So I would just respond to the PR person and then say let’s jump on a quick call and chat about this. For me it was always about getting on the phone, and I think a blogger sometimes will lie on email too much and say X sales are made on the phone or in person. Once I can get on the phone and I could properly communicate what I was doing in my passion and who my readers were, it always became an easy sale. Even when I didn’t have that many readers because brands know the value in having influencers recommend them. Steve: Sure absolutely, so what’s funny is you told me that you only had one employee up until like six months ago, but doing these sponsor type of campaigns it actually takes a lot of work right and a lot of communication. So how do you manage that, it’s not automated right obviously? Kyle: Yeah, oh I wish it was. Well I have always dreamed of one of those businesses, you just set and forget it. Now it is a lot of work, it absolutely it is, and I find that the more work you do in communicating with the client the more likely you are to get a second campaign out of it, that’s how [inaudible 00:11:41] is to get another campaign. We put together these in addition to like keeping contact. At the end of the first month we put together like just pretty little Photoshop report for them as how much traffic we send and how many leads they have. It’s often the same information they have, but sometimes just having it not only visually there, but to show that you are on top of it I think that really helps us. Steve: Okay, so with only person though how can you possibly manage enough of these campaigns to generate millions of dollars, this was kind of what I was getting at? Kyle: Yeah, we’re certainly out of one anymore, so we have almost 20 employees now, so that’s helped to improve, and increase our volume quite a bit. But I would be honest with you before that and I had a good team of freelancers, but it was also just a lot of hustling. It was 18 hours days I was doing what I could, I had a team helping build this as big as I could. Steve: Outside of these sponsor type of campaign — oh actually I was just curious before we move on from sponsor campaigns. Like what is like the average rate given a certain amount traffic for like a sponsor type of campaign? I know it probably varies all across the board, but if you can just give us a rough idea of how much you can charge versus your traffic that would be great. Kyle: Yeah, I think it depends again whether you are charging a flat fee which for small bloggers I recommend just charging a flat fee rather than affiliate. In general I think the going rate is between $75 and $150 CPM. So for every thousand people let’s see it, you can charge 75 to 150, now that’s one piece of content. So you have to kind of look at your average content. If your average gets 2000 views, then maybe you can charge 150-200 bucks. Steve: Okay, what I mean by that is, is it capped or is it like lifetime views, or is it just an ongoing CPM; does that make sense what I’m asking? Kyle: Yeah, we structure in all different ways depending on the advertiser, but I think well we are decided over the flat is we generally offer our guarantee to advertisers. So in our case we offer a guarantee that they’ll get at least 25,000 page views in the first 30 days. And for that we charge $5000. Steve: I see, okay, and how do you decide whether to go affiliate versus CPM? Kyle: That’s often part guide and part of what we found in the past. So our traffic is largely mobile, so we’ve learned that offers that have really long signups, so something that might be three or four pages of singing up or that require a credit card, don’t convert as well because not many people want to be doing that on their phone. If it’s a simple offer where it’s just an email address and a name, that’s more likely for us to do better on our affiliate bases. Steve: Outside, so outside the sponsor content you have banner ads. I think that industry is slowly shifting, right? I know a bunch of my buddies who used to run sites which relied on banner ads, it’s like slowly declining over time. Are you guys still kind of showing those ads or? Kyle: Yeah we still show. We still show banner ads, but I can tell you it’s less than 10% of our overall revenue, and I don’t think we are the only ones. When I look at really large publishers like Huffington Post and Business Insider, they are all getting into this affiliate or performance marketing game too. Have you seen these Business Insider picks where they’ll just, they review something on Amazon and they put it on Amazon? Steve: Yeah. Actually what’s really annoying still is people still have those, they break apart the page into different pages and then– I hate that. Kyle: Yes. I hate that too. One thing I’ll give credit for BuzzFeed is they never went the slide show route. Steve: Yeah, I hate slideshows. Okay, sorry I cut you off though. You were saying something about native advertising in some of the larger companies. Kyle: Yeah, it’s growing. And the other part of it that I see are more large media publishers getting into the subscription business. So choosing Business Insider again, they had this Business Insider intelligence now, and it’s weak and expensive. I think it’s like $1500 a year, but you get pre-email contact to your email. I’ve seen like Talking Points Memo which is a big new site, they’ve done the same thing where for $50 a year, you get an ad free experience. Media is definitely getting tougher and publishers need that recurring revenue to be able to count on. Steve: Are you guys doing anything that generates recurring revenue? Kyle: We are certainly trying. We partnered with Erin Chase this fall on a course called The Grocery Budget Makeover. We are going to be rewriting that this spring. Just one way we are sort of dipping our toes into that and that kind of market. Steve: So we got sponsored posts, you’ve got banner ads and then we have deals with popular bloggers like Erin Chase. Do you guys sell your own products at all? Kyle: No, no never sold anything other than The Grocery Budget Makeover. Steve: Okay. Those I guess sum up all of your income sources then for Penny Hoarder? Kyle: You got it, yeah. Steve: So it’s more like, you guys are kind of like a more traditional type of blog I guess? Kyle: Yeah, I think we hope to eventually be in the category, be seen as a media site. Steve: You definitely are already. I apologize if I insulted you. Kyle: No, not at all. We are on our way. We are not quite there yet. We eventually want to be mentioned in the same graph as the Business Insider or something like that. We certainly have a lot more work to do when it comes to building an audience. Steve: So let’s talk about building an audience. You went from zero to millions of visitors per month in like four years pretty much? Kyle: Yes, I assume a bit more about five years now and we are around 6 million uniques a month now. Steve: Wow, I underestimated, I apologize again. I’m just like insulting you left and right here. Kyle: No. You can never insult me. Steve: Okay, 6 million, that’s crazy. I don’t even know what that feels like, well I did know what it feels like when you crushed my site, but six million visitors a month. How do you– let’s go back to the early days. How do you gain traction? How did you get your early followers, and how did you scale so high in such a short amount of time? Kyle: In the beginning it was all about networking with other bloggers. I was into that site [inaudible 00:18:52] building relationships there. I was commenting on a lot of other blogs. I also did a lot of giveaways. I partnered with hundreds of blogs on different giveaways. Anything I could do. I really don’t believe in that if you build a day will come. I actually believe you have to build the traffic. That was the early days for me. Then I started getting a little bit of PR. I got mentioned on Ubber.com and [inaudible 00:19:24] like Woman’s World Magazine. Kyle: They came to me. Kyle: That was kind of a little bit of a luck. Then I started experimenting with paid advertising. I wasted a tone of money. It was a very expensive learning process, but once I started to crack that code and learned how to buy traffic that would convert on our site and pay for itself, that’s when the explosion really started to happen. Steve: Just so you guys know out there listening, Kyle spends millions of dollars on Facebook ads every year. That’s accurate, right? Millions of dollars. Steve: Yes. Okay, he knows Facebook ads, and I was hoping to kind of shift the conversation now and talk a little bit about that since that was kind of how you got your early traction for your blog, was primarily Facebook. Kyle: Yeah, that’s where it really started to grow. Actually before Facebook, it was Tabula. Tabula was my primary advertising source. I couldn’t make Facebook work. This was like right when Facebook first got their ad exchange. I think a lot of other publishers experienced the same thing that quality wasn’t as good. That’s a complete turn about now, and Facebook is now our primarily source of paid traffic. Steve: So Tabula is like Outbrain, right? Steve: Just for the listeners, Outbrain and Tabula, I don’t know if you’ve noticed at the end of blog post there’s links to other publications, and you get paid per click. Is that how it works? Kyle: Yeah exactly. We use them as a publisher too, we add them at the bottom of our articles, and anytime we sent traffic to another publisher we get paid per click. Steve: Do you guys still use those services or not anymore? Kyle: On the paid side? Yeah a little bit. Definitely not as much as before though. Steve: Because I know for traffic like that it’s like all over the place right, meaning it’s not targeted, it’s random traffic, right? Kyle: In general, it’s not very well targeted. However, they are adding more targeting options now. The problem with Tabula and Outbrain, well they are great. They have so many millions of publishers and only a small percentage of them are really high quality sites. You really have to do your homework and pick out sites that you want to target and not just let them run the network. Steve: Let’s talk about Facebook since it’s very targeted. I actually got a quick lesson from you during our mastermind retreat last year. I actually started implementing some of your Facebook strategies earlier this year as kind of like a New Year’s resolution. Okay, I’ve run Facebook ads successfully for my physical products, but with the blog it’s a little different. So you are driving traffic to your content, and so first of all my first question is how do you know whether they are profitable? Do you know exactly how much a visitor is worth on a particular page? Kyle: We do, yeah although not at first, so any time we publish a new piece of content, we have to figure out what that page is, it’s called our PMS [ph]. The revenue per user and so every new piece of content has its own RPU. And we do use a piece of software called [inaudible 00:22:47] to help us figure that out. Steve: How does that work. Like how do you figure that out? Kyle: We take out all of the different offers, all the different ways we are getting paid from that article, and we add it up and then simply divide by the number of pages we got in the same time period. Steve: But how do you know? Like if it’s an affiliate offer, you don’t have conversion tracking information for that offer, right? Kyle: Thankfully we do. With our platform has offer, so we actually have the advertiser place a pixel on their page, so we can track when it gets converted. That’s how to scale quite a bit. In the early days, I didn’t have that. I was a lot of guess estimating, and it didn’t always make for good advice, because I didn’t know exactly. I would say, I think the RPU is between this and this and this and this amount. We got a lot more specific now. Steve: That was the missing piece of the puzzle for me at least. You can actually convince an advertiser to add one of your tracking pixels on their check out success page. Steve: Okay, do you need cloud to do that? Kyle: I didn’t – being a high volume partner is helpful. So you don’t necessarily need to be a big site, but if it’s a good partner for them, then yes it helps. The other easy way to do it is to go through the affiliate networks. Often times your affiliate manager can help facilitate that. Steve: Interesting. That’s one thing that I’m definitely not doing. Okay, so you figure out how much money a visitor is worth, and then what’s the next step of the process? Kyle: Yeah, so then really my role is to be able to buy traffic for less than that, and hope that the conversion rate stays the same because obviously paid and organic traffic can convert very differently. From there, we start testing ads. We often test hundreds and hundreds of different creatives to find one that gets us a really low cost per click. Steve: In the beginning you said hundreds of creatives, so you just start out– so there’s different components to Facebook ads. There’s the creative, there’s the target and then there’s the bidding I guess. Let’s say you had one post that you wanted to promote, how do you tell– like what’s your targeting, like how do you start with the targeting? Kyle: I’m sure if you ever used like the Facebook power editor, it’s a little bit clunky, and it can be really difficult to build a lot of ads pretty quickly. So we get to use another software, and it’s really affordable called AdEspresso. What’s great about it is I can just add in all of my headlines, all of my images and all the different things I want to target, and AdEspresso will build out an ad for every single variation. If I give it five headlines, five images, and five different groups of people, I’m going to get 125 different ads. It takes literally like 30 seconds to build. That’s been really helpful for us, because then once they are alive, you can start to track to see not only what headlines they are working the best, but what groups are responding to it. That can help you narrow your targeting down even better. Steve: What’s your initial budget during like the testing phase while you are trying to figure out what’s going to work and what’s not? Kyle: It depends on the article obviously. In general I say that for every variation you make, you need at least 20 bucks for that variation to get statistically significant result. I don’t suggest making 150 variations if you are not ready. Steve: Sure of course. I was just curious how you do it, so 20 bucks per variation. Kyle: Yeah, in general that gets you a few thousand impressions per variation. Steve: Do you just let Facebook do all the bidding for you in the beginning? Kyle: I do. That actually is a strategy we changed recently. We’ve moved to letting Facebook optimize the bid. We found that actually in our case has resulted in the lower CPCs. Steve: Do you have a conversion goal for this, or do you just set it to clicks for the website? Kyle: We don’t currently use Facebook excellent conversion goals, but we are hoping to get that done this quarter. Steve: Interesting. I was just curious when you’ve experimented whether it has made a difference in the types of people that it sends or shows the ads to. Kyle: Yeah, I’m really curious about that too. We think that’s going to be huge for us is having these with optimized based off of conversions. Steve: Okay, so you are bidding based on clicks to your website, it sounds like you are letting Facebook just bid whatever it wants. Given like– we had a conversation prior to recording here and you mentioned that some of your CPCs are like below ten cents sometimes as low as two cents. And in my experience at least, it has taken me a long time. Some articles I can get like, I think the lowest I ever got was like six cents, but some articles I can just never get it down to there. What is your process for getting the bids down lower? Kyle: Well, I will say one thing that we do differently than a lot of Facebook advertisers is that we use much bigger targeting groups. Facebook is great because you can get so fine. You know you can pick out people who just watch Simpsons after 11 o’clock. It’s insane how crazy it gets. The more targeted you get; the more expensive the click is going to be. Our content, we also finance a much broader appeal or we hope it does. We don’t get too fine. We like to have groups that have at least ten million people in them. Kyle: Yup. It definitely helps with CPCs. Then beyond that, we write out, often times, up to a 100 headlines per post. We will just exhaust our creativity in coming up with different ways, and then pick out our favorite five or ten to test on Facebook, but you have no idea how important that is. I consider myself a pretty good headline writer, but when I actually get down to testing them, sometimes one headline will get CPCs at 30 cents, and sometimes I get some at a penny even though I thought they were both just as good. Writing out millions of headlines is super important. Kyle: Thank you. I appreciate it; yeah headlines have changed a lot in the last year. It used to be you could write these really leading headlines and of course they always had ellipses after them. Anybody would click anything, but I think we all got wise to that, and got tired of it. Now, the new trick is to, you still want to leave a curiosity gap in the headline, but you want to give more of it away. I’ll give you an example; I saw a really good headline yesterday. It was, I think it was from CNN. It was “89 year old grandma graduates college. Here’s why.” Like you know exactly what happened. You know how old she is, you know she’s graduated, but of course I want to know what she was going to do with her degree like there was still curiosity there, but I didn’t feel like they were beating me. Steve: Yeah, then you will have a headline like “Here’s like ten ways to make money just surfing the web,” or something like that and I’ll be like, oh I can make money surfing the web? I should check it, and then you’ll give all these services where you can actually do that, right? It’s important to follow through. Kyle: Yes, exactly. I mean, your CPCs will always be high if the users aren’t sharing once they get to the site. That’s really the secret to driving it down. It’s you need people to share it. The better your engagement rate is, the more your Facebook will show your ad, and the lower your CPC will be. Steve: 20 bucks per– so it sounds like you have different creatives, different headlines, and then do you different landing pages too? No, the pages are always the same. You don’t change the landing page, right? Kyle: We are going to start working on that this year. We are working with an AB set software to like test different introductions and different ways to lay out the article. Because like I said, the engagement rate is probably more important than the click through rate now. We really feel like we need to test our content as well. Steve: What I was trying to get at there was does that the headline always match the title of the post when someone lands? Kyle: It definitely matters. The headline certainly matters. That’s the first impression people are getting of you. But if they aren’t sharing it, then Facebook will give what’s– they have this new score card called the relevancy score which is how well people actually liked the post. And Google is doing the same thing with organic now. They are measuring how long people are staying on the site, are they sharing it, are they bookmarking it. Then using that as a parameter to impact your CPCs. Steve: Is how you manage to get such low CPCs because so many people share your content? Kyle: Yeah, that’s definitely a huge part of the puzzle. Then that also has the added benefit of bringing in some free organic traffic which of course lowers the CPC further. Steve: Just curious, outside of just having big share buttons on your site, what are some other ways that you encourage people to share? Kyle: We’ve been testing a new share button now that’s really fun. It’s the Penny Hoarder. It’s now our share button at the button of your mobile screen is a penny. You just slide the penny to share it. Kyle: It’s just a little bit different. I think we all read so much content now that people get blind to the same thing over and over again. Anything you can do that’s a little bit different certainly helps. The last thing we do is when we are drafting our post, we actually write on the draft, who will share this post. If there’s nobody in our office that’s willing to share the post with their friends, it’s not a post we want to put on the blog, because if we are not going to share it, our readers are not going to be willing to share it. We look for pieces of content that have target, like groups behind them. I’ll give you a really great example. I saw this post earlier this week about this guy who worked for Nintendo and he’s revealing 15 Mario secrets. That’s such a great targeted post, because we all have a friend that loves Mario, or we have some memory growing up with it. When you look through the comments, it’s not a bunch of comments commenting on Mario, it’s people tagging their friends and saying, “Remember third grade or whatever.” I think we look for content that does that same kind of thing. Steve: Interesting. Actually that means it pays to kind of link different themes together and kind of mix like the guts of the content in with it. Steve: It’s basically what you are telling me. Kyle: Yes absolutely. I’ll tell you, the most viral post we ever heard was last month. We wrote this very short 300 blog post. Red robin was giving away free food, and we write about free food all the time. It does well, but this guy almost 2 million hits in 48 hours. And the reason is that the way Red Robin was giving away food was if you had a certain name. I think it was like if your name was Michael or Betty or whatever. We got tens of thousands of people commenting because we all know someone named Michael. I think those are the posts that do well on Facebook now is it wasn’t that it was free food, it’s that we wanted to share it with somebody and let them know we were thinking of them. Steve: That is an incredible tip actually. Do you guys find that you are doing this more now on The Penny Hoarder. I actually subconsciously didn’t even notice. I’m going to poke your site right now. Kyle: Yeah, we are. We are certainly trying to do a better job of that, trying to figure out who it is that will actually share this. Steve: Do you find that you are getting a lot more traffic from Facebook as opposed to like Google? Kyle: Facebook is definitely a bigger traffic source for us, but to be honest with you the organic traffic we receive from Facebook has certainly declined. That’s something all publishers are feeling that Facebook shows organic stuff less and less. Steve: The reason why I asked is I find that, so I get a lot of Google traffic and that’s actually where most of my traffic comes, and all that traffic tends to be really targeted and converts pretty well. I was just curious what your experience has been with Facebook traffic in terms of conversions versus Google. Kyle: On the organic side, yes. Google is more– those visitors convert better for us. On the paid side, we’ve actually had better success with Facebook. Because with Google most – targeting options are keyword based, and with Facebook you can add obviously demographic and permission in there which we find has an even bigger impact. Steve: And so do you actually buy AdWords ads at all? Steve: Okay. So you have to make those profitable first. Have you found that the AdWords ads for content have been too expensive? Kyle: They are. In our experience, they are little bit more expensive than Facebook. I think it’s largely because of the keywords that are in our category. I mean, personal finance key words are usually the most expensive keywords. Steve: Exactly, that’s why I was asking. Kyle: Yeah. We don’t face that same kind of competition on Facebook. Kyle: We don’t– yeah we certainly couldn’t afford to pay that much. As a result we don’t get as much traffic from it. Steve: Okay, do you guys do anything special to increase your rankings in Google, or is that not like an area where you focus a lot of effort on. Kyle: I wouldn’t say it’s big an effort for us although we just did bring on a PR person. It’s not so much for like building targeted links and on site optimization more; it’s just getting our brand mentioned on large sites which has the same effect. I think Google has made it very clear that they don’t want us gaming. Even though everyone does, and it still works, we try to be a good partner there. Steve: Okay. Back to Facebook, it sounds like the way you get the clicks down, and then your traffic up on Facebook is you just try a whole bunch of different things. You spend 20 bucks on a whole bunch of different permutations of everything it sounds like. Then you stick with like the best three or? Kyle: Yeah, that’s really a good point. I don’t– once I find the winning ad, I don’t turn off all of the other ads. I try to keep, like you said maybe like the top three. The reason is, is that in our case especially people have ad blindness. Once they’ve seen the same ad a couple of times, not only aren’t they going to click it, but a lot of times they get annoyed. They may block you or block the ad. I think it’s important to have a few ads in rotation so that your frequency stays low. Steve: When does the frequency get too high for you? Kyle: Generally like the CPC is at its lowest when the frequency is below three. By the time frequency has gone up 6 to 8, this is every person in your target group is seeing it 6 to 8 times. Steve: Yeah, yeah, you let it get that high? Kyle: I do, on certain posts because they– I mean we had some ads that we’ve been running for two years, and that have been seen hundreds of millions of times, but they still convert and so we’ll never get rid of them. We don’t get it; we get much less traffic from them. They may have been a high flier once before, but now maybe we can only afford to spend a couple of hundred bucks a day on them. Steve: Once you find an ad that works, like do you gradually ramp up the ad spend. Personally just from my experience, I find that when I do a ramp and jump and bid like the conversion just goes to crap for a little bit. Kyle: I think that’s true with anything. As you scale it, the conversion rate goes down and same with our display ads. The more traffic we get the lower our CPNs are. You do have to plan for that. In general yes, I do. If I have something that I’m getting for four cents and then converting on my site for nine cents, I’m just going to let Facebook go. Steve: Meaning like no budget or? Kyle: Yeah, we are very high budget. As long as– and we monitor them. We monitor them all day long even on the weekends to make sure that our ads are still profitable. Yes, as long as they are profitable I want it to be seen as many times by as many people. Steve: Just curious, what is like no budget for you, for an ad? Like what’s …? Kyle: I think we– well, I’ll put it in another way. I think maybe the largest ad we have, the most is we’ve ever spent is maybe $10,000 a day. Steve: 10,000 a day? Good lord. So these audiences have to be large for you then. Kyle: Yeah. That’s exactly yeah, like I said, not less than 10 million. We have some ads that the targeting is completely open, which is generally a big no, no. Steve: Open as in like no targeting, like everyone in the US? Steve: Do you target international or is it mainly US? Kyle: We double. I’ve had a tougher time with international audiences, but we do have a couple of Canadians and Australian themed pieces of content. Steve: Every fall out like the look alike audiences at all? Kyle: Yes, just in the last couple of months I’ve been doing more with look alikes. We’ve been growing our email list quite a bit, and so my concern is I always wanted to make sure we kept our audience to million plus. I had to have a large enough email list to build a look alike audience that was large enough. Steve: It sounds like so with ten million plus your budget has to be big in general to kind of hit that audience. Is the reason you choose ten million because you don’t want to manage it like on a day to day basis as much? Kyle: It definitely makes it easier. I guess our goals are a little bit different since that– the most important metric to us is unique users. We want to see that we are growing every month. We need, we have to expand outside of our core audience. We can’t just go after people that are fanscoupons.com, that kind of is part of my thinking too. Steve: You guys don’t do any retargeting then or? Kyle: We do a little bit of retargeting, but it depends on the article. Often times with our paid advertising, we are promoting the same thing that we’ve been promoting for a long time. We don’t want to make our audience; our current fans see the same thing over and over again. A lot of our ads are targeted towards new readers. Steve: What is for your best performing ads like what’s a typical click through rate? Kyle: Best performing ads are above 10%? Steve: Above 10%? That is insane. Let’s shift gears a little bit to emails since you have 424,000, would you say 700,000 email subscribers. When you, just for the listeners, when you get that many emails, you can’t just like blast everyone all at once because that’s crazy. How do you manage your list, and what do you choose to send to who, and how do you manage that? Kyle: We’ve always been really protective with our list. We never rented it out. We never even let a sponsor buy it out. For us, we want to keep a really high open rate, and so that’s always meant having just as engaging content and the newsletters we do with our site. We use it primarily as a way to drive traffic back to the blog. These are our most dedicated readers. It does get challenging when you get that many. I told you in the beginning, I didn’t know anything about blogging when I first started. I’ve had to learn a lot about even the text side, just to be able to manage that kind of list. We do use an email service provider, but we’ve had to be more strategic about bringing on additional theme, like additional IP addresses and making sure that we are spreading the send out over multiple hours, so that we don’t get targeted spam. Steve: What’s considered a good open rate for you? What are you happy with when you send out a blast? Kyle: Our target is 30%. Steve: 30%, that’s really high. Does that imply then you have a very well segmented list. Kyle: We don’t have a well segmented list, but we do clean the list quite frequently. So if someone stops engaging with us, we will send them an email asking them to please start reading us again. Do you want to stay out of this list or not? If they don’t then we remove them, because we want to keep a good open rate, and a good click through rate. Steve: What are your metrics for doing that like people haven’t opened in six months or? Kyle: Yeah, six months is generally the metric we use. I also– I guess the one segment we do use is we have a segment of our really engaged users, people that open every newsletter and they get the email first, because the way things like [inaudible 00:46:32] work which is this imaginary score that every email gets that tells Gmail or yahoo whether to let your email come through. You want to have your initial emails being opened a lot, and you want to have people clicking them, because that’s a sign to Gmail that this is a trusted piece of content. We send to our engaged users first, and we let it build up a little bit of traction, and then we send it out to newer users and less engaged folks. Steve: Interesting. Have you found the measured difference when doing this? Kyle: Oh yeah, absolutely. You can see it in your bounce rates too and your spam rates. Steve: Wow. I did not– I don’t do that. I did not know that. So you always do two sends for everything? Kyle: I do yeah. Actually we do way more than that because we also AB test the email. Every email has just like our Facebook ads has multiple tasks for email subject lines, and we’ll often even AB test the images and headlines inside of the email as well. Steve: Do you do AB testing on your loyal readers or the other guys? Steve: Okay. So for the loyal readers, you said they open everything. Are you just testing click through rate at that point. Kyle: Yeah, I mean even with our loyal readers, the open rate is less than 50%. It’s hard to get much higher than that unless you personally know that person. It’s still useful to us. Again, even though we think we are great at headlines, it’s not uncommon for our best email to convert twice as well as our worst subject line. Steve: Okay, so we are talking 30 to 50% open rates. That is amazing. Before we got on this podcast, you were telling me like the ways that you acquire email addresses is pretty cool too. Can we talk a little bit about that? Kyle: Yeah, sure we use a company called Bounce Exchange. I know like Exit Intent is really big right now, any user getting ready to leave your site, whether they’ve– when they use it by tracking your mouse. It sounds kind of creepy, but when your mouse gets close to your back button on your browser, we ask you to subscribe to our email newsletter via a light box on overlay. That’s been working really well for us. In fact the last couple of months, we’ve started collecting over 10,000 emails a day. Steve: Just think about that for a moment for everyone listening, 10,000 emails a day. That is just insane. There is a lot of blogs out there who don’t even have 10,000 subscribers. Kyle: Believe me; I had maybe a thousand subscribers for 4 years. It still surprised me that that many new people are subscribing every day. Steve: You were mentioning that the service also tries different things and it tests all the different forms for you, so it automatically shows the one that converts the best, right? Kyle: Yes, our model here is all about putting signs behind properties, so viral is something that sounds like it can be replicated. We are hoping that we can figure out, crack the code here. Everything on our site gets tested and that includes these email overlays which are always changing not only the words in there, but we test things like the button color or when to show it to you. And it’s again it’s amazing what a difference in the click through rate it makes. Steve: What is your most dramatic difference in one of your tests? Kyle: Last I think that maybe 18 months ago we changed the color of links on our sites. So whenever we were linking out to whether it was on affiliate offer or even just some news article, we changed it from dark pink to dark purple, and it resulted in a 17% increase in click through rate. Just one little X code we changed which also meant 17% in revenue. Steve: That’s insane because whenever I teach like split testing, I always like don’t bother with the colors like focus on the big things like the headlines. So here you are like totally debunking that, and changing a color and making such a big difference. I think just for the people who are listening out there Kyle can do this because he gets insane traffic. If you don’t have insane traffic, I wouldn’t test colors that’s just my — I don’t know would you agree? Kyle: Yeah, absolutely. You start with the big stuff always, but every time I think I have become an expert I am completely humbled by an AB test. And I told you at the beginning that I used to work on campaigns, and I still take so much inspiration from the way political campaigns are doing internet targeting, it’s way more advanced than most blogs or ecommerce companies. We all know like the story of the Obama campaign for 2008 and the crazy targeting they did. But they also on their contribution page they never stopped testing different ways to lay out that forum, or different colors on the submit button. And they estimated that those AB tests equaled an additional $50 million in contributions from them, and that to me is still an inspiration to never stop testing. Steve: That blows my mind, what software do you use for your split testing? Kyle: Optimizely for the site. Steve: Okay, awesome, hey Kyle I have already occupied your time for 50 minutes, thank you so much for coming on the show. I learned a lot, and I am actually going to be implementing a lot of stuff that you were talking about starting with the initial send, that’s a great idea, I had no idea. Kyle: Yeah, I’m so glad you invited me on; it was a blast chatting with you. Steve: So Kyle where can people get a hold of you, what should they check out on your site? Steve: Who doesn’t want to learn about making extra money? Kyle: Hopefully maybe you’ll get some ads and headline inspiration. Steve: No, the headlines are amazing, no joke, go check out the headlines; you’ll definitely learn something just through the copy alone. And plus the site is just pretty amazing from an aesthetic perspective as well. Kyle: Well thank you, I appreciate that. Steve: All right Kyle, thanks a lot man. Steve: What an incredible episode, the numbers that Kyle have demonstrated are truly mind blowing. And I actually recorded this episode a couple of months ago, and I decided to kind of just check his numbers, and he is at 729,000 email subs now, and almost 2 million Facebook fans, that is crazy. For more information about this episode go to mywifequiteherjob.com/episode112, and if you enjoyed this episode please go to iTunes and leave me a review. It’s by far the best way to support the show and please tell your friends, because the greatest compliment that you can give me is to refer this podcast to someone else either in person or to share it on the web. Now if you’re interested in starting your own online business, be sure to sign up for my free 6 day mini course where I show you how my wife and I managed to make over 100K in profit in our first year of business. So go to mywifequiteherjob.com for more information, sign up right there on the front page, and I’ll send you the course right away via email. Thanks for listening. LOVE this interview. ThePennyHoarder is an awesome site and it’s amazing how much it’s grown. Thanks Michelle! That means so much to me. It’s been a lot of hard work (is 29 too early to start plucking gray hair? ), but I’m having a blast! Thanks Anna! So kind! It seems like every time I get on a call with an advertiser lately, they ask us to do something like what you’ve done on your site. Hope you’re killing it and that you’ll be at FinCon this year! I thought this was a great podcast ! So much so that I posted to it on my (small & currently unsubstantial) website. Of course with links to yours & Kyles websites. Well done … Thanks guys ! Very insipring. Wow, he’s young, for some reason I thought the owner of this site was older. I’ve been a subscriber for years. I was floored by how much this blog generates. Great podcast! Thank you Steve for this amazing interview with Kyle. Its really insightful. I wonder if Wkyle has a ‘how to successgully run a blog’ product. I would be quick to sign up. Hey Steve, great podcast as usual. I listened while driving and I decided to come check the show note here but couldn’t see the numerous websites mentioned on the podcast. Kindly put this in mind.